This article is about the landmark in Paris, France. For other uses, see Eiffel Tower (disambiguation). The Eiffel Tower (/ˈaɪfəl/ EYE-fəl; French: Tour Eiffel [tuʁ‿ɛfɛl] ( listen)) is a wrought-iron lattice tower on the Champ de Mars in Paris, France. It is named after the engineer Gustave Eiffel, whose company designed and built the tower. Constructed from 1887 to 1889 as the entrance to the 1889 World's Fair, it was initially criticised by some of France's leading artists and intellectuals for its design, but it has become a global cultural icon of France and one of the most recognisable structures in the world. The Eiffel Tower is the most-visited paid monument in the world; 6.91 million people ascended it in 2015. The tower is 324 metres (1,063 ft) tall, about the same height as an 81-storey building, and the tallest structure in Paris. Its base is square, measuring 125 metres (410 ft) on each side. 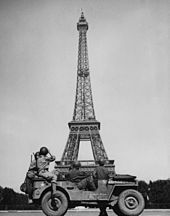 During its construction, the Eiffel Tower surpassed the Washington Monument to become the tallest man-made structure in the world, a title it held for 41 years until the Chrysler Building in New York City was finished in 1930. It was the first structure to reach a height of 300 metres. 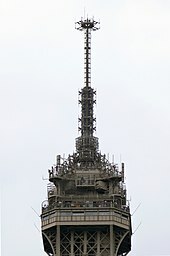 Due to the addition of a broadcasting aerial at the top of the tower in 1957, it is now taller than the Chrysler Building by 5.2 metres (17 ft). Excluding transmitters, the Eiffel Tower is the second tallest free-standing structure in France after the Millau Viaduct. The design of the Eiffel Tower is attributed to Maurice Koechlin and Émile Nouguier, two senior engineers working for the Compagnie des Établissements Eiffel. It was envisioned after discussion about a suitable centrepiece for the proposed 1889 Exposition Universelle, a world's fair to celebrate the centennial of the French Revolution. Eiffel openly acknowledged that inspiration for a tower came from the Latting Observatory built in New York City in 1853. In May 1884, working at home, Koechlin made a sketch of their idea, described by him as "a great pylon, consisting of four lattice girders standing apart at the base and coming together at the top, joined together by metal trusses at regular intervals". 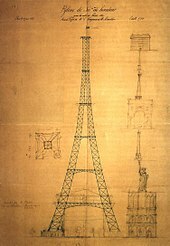 Eiffel initially showed little enthusiasm, but he did approve further study, and the two engineers then asked Stephen Sauvestre, the head of company's architectural department, to contribute to the design. Sauvestre added decorative arches to the base of the tower, a glass pavilion to the first level, and other embellishments. At first the legs were constructed as cantilevers, but about halfway to the first level, construction was paused in order to create a substantial timber scaffold. 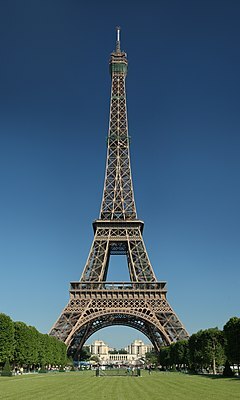 This renewed concerns about the structural integrity of the tower, and sensational headlines such as "Eiffel Suicide!" 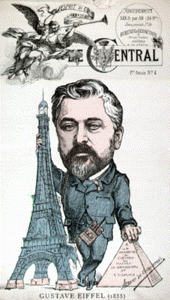 and "Gustave Eiffel Has Gone Mad: He Has Been Confined in an Asylum" appeared in the tabloid press. At this stage, a small "creeper" crane designed to move up the tower was installed in each leg. They made use of the guides for the lifts which were to be fitted in the four legs. The critical stage of joining the legs at the first level was completed by the end of March 1888. Although the metalwork had been prepared with the utmost attention to detail, provision had been made to carry out small adjustments in order to precisely align the legs; hydraulic jacks were fitted to the shoes at the base of each leg, capable of exerting a force of 800 tonnes, and the legs were intentionally constructed at a slightly steeper angle than necessary, being supported by sandboxes on the scaffold. Although construction involved 300 on-site employees, only one person died, due to Eiffel's safety precautions and the use of movable gangways, guardrails and screens. The Roux, Combaluzier & Lepape lifts during construction. Note the drive sprockets and chain in the foreground. The tower is painted in three shades: lighter at the top, getting progressively darker towards the bottom to complement the Parisian sky. It was originally reddish brown; this changed in 1968 to a bronze colour known as "Eiffel Tower Brown". A pop-culture movie cliché is that the view from a Parisian window always includes the tower. In reality, since zoning restrictions limit the height of most buildings in Paris to seven storeys, only a small number of tall buildings have a clear view of the tower. More than 250 million people have visited the tower since it was completed in 1889. In 2015, there were 6.91 million visitors. The tower is the most-visited paid monument in the world. An average of 25,000 people ascend the tower every day which can result in long queues. The tower has two restaurants: Le 58 Tour Eiffel on the first level, and Le Jules Verne, a gourmet restaurant with its own lift on the second level. This restaurant has one star in the Michelin Red Guide. It was run by the multi-Michelin star chef Alain Ducasse from 2007 to 2017. Starting May 2019, it will be managed by three star chef Frédéric Anton. It owes its name to the famous science-fiction writer Jules Verne. Additionally, there is a champagne bar at the top of the Eiffel Tower. From 1937 until 1981, there was a restaurant near the top of the tower. It was removed due to structural considerations; engineers had determined it was too heavy and was causing the tower to sag. This restaurant was sold to an American restaurateur and transported to New York and then New Orleans. It was rebuilt on the edge of New Orleans' Garden District as a restaurant and later event hall. In 2011, the TV show Pricing the Priceless on the National Geographic Channel speculated that a full-size replica of the tower would cost approximately US$480 million to build. This would be more than ten times the cost of the original (nearly 8 million in 1890 Francs; ~US$40 million in 2018 dollars). ^ a b c "Eiffel Tower". CTBUH Skyscraper Center. ^ a b c SETE. "The Eiffel Tower at a glance". Official Eiffel Tower website. Archived from the original on 14 April 2016. Retrieved 15 April 2016. ^ Engineering News and American Railway Journal. 22. G. H. Frost. 1889. p. 482. ^ a b Loyrette, p. 116. ^ Paul Souriau; Manon Souriau (1983). The Aesthetics of Movement. University of Massachusetts Press. p. 100. ISBN 0-87023-412-9. ^ Jill Jonnes (2009). Eiffel's Tower: And the World's Fair where Buffalo Bill Beguiled Paris, the Artists Quarreled, and Thomas Edison Became a Count. Viking. pp. 163–64. ISBN 978-0-670-02060-7. ^ Guillaume Apollinaire (1980). Anne Hyde Greet (ed.). Calligrammes: Poems of Peace and War (1913–1916). University of California Press. pp. 411–414. ISBN 978-0-520-01968-3. ^ a b c d SETE. "Origins and construction of the Eiffel Tower". Official Eiffel Tower website. Archived from the original on 31 July 2015. Retrieved 1 January 2014. 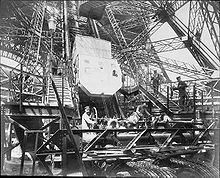 ^ "Construction of the Eiffel Tower". wonders-of-the-world.net. ^ a b Vogel, p. 28. ^ a b Vogel, pp. 23–24. ^ Eiffel, Gustave (1900). La Tour de Trois Cents Mètres (in French). Paris: Société des imprimeries Lemercier. pp. 171–3. ^ a b SETE. "The Eiffel Tower during the 1889 Exposition Universelle". Official Eiffel Tower website. Archived from the original on 25 April 2016. Retrieved 16 April 2016. ^ Eiffel, Gustave (1900). La Tour de Trois Cents Mètres. Paris: Lemercier. p. 335. ^ Jill Jonnes. "Thomas Edison at the Eiffel Tower". Wonders and Marvels. Retrieved 2 January 2014. ^ "M. Santos Dumont's Balloon". News. The Times (36591). London. 21 October 1901. col A, p. 4. ^ Theodor Wulf. Physikalische Zeitschrift. Contains results of the four-day-long observation done by Theodor Wulf at the top of the Eiffel Tower in 1910. ^ "L'inventeur d'un parachute se lance de le tour Eiffel et s'écrase sur le sol". Le Petit Parisien (in French). 5 February 1912. p. 1. Retrieved 26 November 2009. ^ Barbara Wertheim Tuchman (1994). August 1914. Papermac. p. 236. ISBN 978-0-333-30516-4. ^ Stephen Herbert (2004). 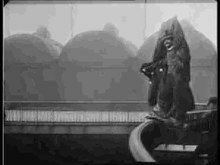 A History of Early Television. 2. Taylor & Francis. p. 40. ISBN 978-0-415-32667-4. ^ Piers Letcher (2003). Eccentric France: The Bradt Guide to Mad, Magical and Marvellous France. Bradt Travel Guides. p. 105. ISBN 978-1-84162-068-8. ^ "An air tragedy". The Sunday Times. Perth, WA. 28 February 1926. Retrieved 2 January 2012. ^ Claudia Roth Pierpont (18 November 2002). "The Silver Spire: How two men's dreams changed the skyline of New York". The New Yorker. Archived from the original on 27 February 2012. ^ a b Harriss, pp. 180–84. 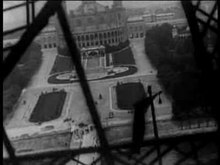 ^ "HD Stock Video Footage – The Germans unfurl Nazi flags at the captured Palace of Versailles and Eiffel Tower during the Battle of France". www.criticalpast.com. ^ Smith, Oliver (4 February 2016). 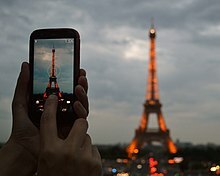 "Eiffel Tower: 40 fascinating facts" – via www.telegraph.co.uk. ^ Carlo D'Este (2003). Eisenhower: A Soldier's Life. Henry Holt and Company. p. 574. ISBN 978-0-8050-5687-7. ^ SETE. "The major events". Official Eiffel Tower website. Archived from the original on 31 March 2015. Retrieved 13 March 2014. ^ a b SETE. "The Eiffel Tower's lifts". Official Eiffel Tower website. Archived from the original on 7 April 2016. Retrieved 15 April 2016. ^ Nick Auf der Maur (15 September 1980). "How this city nearly got the Eiffel Tower". The Montreal Gazette. Retrieved 29 May 2013. ^ Robert J. Moriarty. "A Bonanza in Paris". Air & Space Magazine. Retrieved 4 April 2008. ^ Jano Gibson (27 February 2007). "Extreme bid to stretch bungy record". Sydney Morning Herald. Retrieved 24 May 2010. ^ "Tour Eiffel". Thierry Devaux (in French). Retrieved 19 March 2019. ^ SETE. 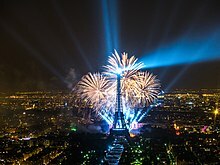 "The Eiffel Tower's illuminations". Official Eiffel Tower website. Archived from the original on 22 August 2015. Retrieved 31 May 2014. ^ a b c SETE. "All you need to know about the Eiffel Tower" (PDF). Official Eiffel Tower website. Retrieved 15 April 2016. ^ "The Eiffel Tower". France.com. 23 October 2003. Retrieved 16 April 2016. ^ Denis Cosnard (21 April 2014). "Eiffel Tower renovation work aims to take profits to new heights". The Guardian. Retrieved 14 April 2016. ^ Darwin Porter; Danforth Prince; G. McDonald; H. Mastrini; S. Marker; A. Princz; C. Bánfalvy; A. Kutor; N. Lakos; S. Rowan Kelleher (2006). Frommer's Europe (9th ed.). Wiley. p. 318. ISBN 978-0-471-92265-0. 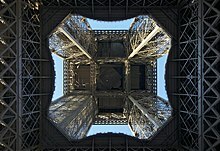 ^ "Eiffel Tower gets glass floor in refurbishment project". BBC News. 6 October 2014. Retrieved 6 October 2014. ^ David A. Hanser (2006). Architecture of France. Greenwood Publishing Group. p. 66. ISBN 978-0-313-31902-0. ^ DK Eyewitness Travel Guide: Europe. Dorling Kindersley. 2012. p. 163. ISBN 978-1-4093-8577-6. ^ SETE. "Debate and controversy surrounding the Eiffel Tower". Official Eiffel Tower website. Archived from the original on 8 September 2015. Retrieved 2 January 2013. ^ a b "Elegant shape of Eiffel Tower solved mathematically by University of Colorado professor". Science Daily. 7 January 2005. Retrieved 24 May 2010. ^ SETE. "FAQ: History/Technical". Official Eiffel Tower website. Archived from the original on 8 April 2016. Retrieved 16 April 2016. ^ Caitlin Morton (31 May 2015). "There is a secret apartment at the top of the Eiffel Tower". Architectural Digest. Conde Nast. Retrieved 30 June 2015. ^ Mary Papenfuss (20 May 2016). "Tourists have the chance to get an Eiffel of the view by staying in the Tower for a night". International Business Times. Retrieved 21 May 2016. ^ SETE (2010). "The Eiffel Tower Laboratory". Official Eiffel Tower website. Archived from the original on 12 February 2017. Retrieved 25 January 2017. ^ SETE. "The Eiffel Tower gets beautified" (PDF). Official Eiffel Tower website. Archived from the original (PDF) on 21 November 2015. Retrieved 8 November 2015. ^ SETE. "Painting the Eiffel Tower". Official Eiffel Tower website. Archived from the original on 26 October 2016. Retrieved 25 January 2017. ^ "History: Development of clear span buildings – Exhibition buildings". Architectural Teaching Resource. Tata Steel Europe, Ltd. Archived from the original on 5 October 2013. Retrieved 4 January 2014. ^ "The Eiffel Tower". France.com. Retrieved 27 January 2018. ^ SETE. "Getting to the Eiffel Tower". Official Eiffel Tower website. Archived from the original on 14 April 2016. Retrieved 16 April 2016. ^ "Number of Eiffel Tower visitors falls in wake of Paris attacks". France 24. 20 January 2016. Retrieved 15 April 2016. ^ Jean-Michel Normand (23 July 2007). "Tour Eiffel et souvenirs de Paris". Le Monde. France. Retrieved 24 May 2010. ^ "Eiffel Tower reopens to tourists after rare closure for 2-day strike". Associated Press. Fox News. 27 June 2013. Retrieved 16 April 2016. ^ Dali Wiederhoft. "Eiffel Tower: Sightseeing, restaurants, links, transit". Bonjour Paris. Archived from the original on 6 January 2014. ^ "Eiffel Tower in Paris". Paris Digest. 2018. Retrieved 14 September 2018. ^ Marcus, Frances Frank (10 December 1986). "New Orleans's 'Eiffel Tower'". The New York Times. Retrieved 22 November 2018. ^ Thomas, Jabari (15 September 2015). "Where you can find pieces of the Eiffel Tower in New Orleans". WGNO. Retrieved 22 November 2018. ^ "The Blackpool Tower". History Extra. Retrieved 6 March 2014. ^ "The red and white Eiffel Tower of Tokyo". KLM. Retrieved 16 April 2016. ^ Todd van Luling (19 August 2013). "The most legit Eiffel Tower replicas you didn't know existed". Huffpost Travel. Retrieved 16 April 2016. ^ "Eiffel Tower". Pricing the Priceless. Season 1. Episode 3. 9 May 2011. National Geographic Channel (Australia). ^ "Paris time by wireless". The New York Times. 22 November 1913. p. 1. ^ a b Steve Schlackman (16 November 2014). "Do night photos of the Eiffel Tower violate copyright?". Art Law Journal. Retrieved 15 April 2016. ^ "Cour de cassation 3 mars 1992, Jus Luminum n°J523975" (in French). Jus Luminum. Archived from the original on 16 November 2009. ^ Jimmy Wales (3 July 2015). "If you want to keep sharing photos for free, read this". The Guardian. Retrieved 15 April 2016. ^ "The Eiffel Tower image rights". Société d'Exploitation de la Tour Eiffel. ^ Hugh Morris (24 June 2015). "Freedom of panorama: EU proposal could mean holiday snaps breach copyright". The Telegraph. Retrieved 15 April 2016. ^ "Eiffel Tower: Repossessed". Fast Company. 2 February 2005. Retrieved 15 April 2016. ^ James Arnold (16 May 2003). "Are things looking up for the Eiffel Tower?". BBC News. Retrieved 16 April 2016. ^ Chrysler (14 June 2004). "Chrysler Building – Piercing the Sky". CBS Forum. CBS Team. Retrieved 21 May 2017. Chanson, Hubert (2009). 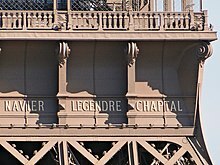 "Hydraulic engineering legends Listed on the Eiffel Tower". In Jerry R. Rogers (ed.). Great Rivers History: Proceedings and Invited Papers for the EWRI Congress and Great Rivers History Symposium. American Society of Civil Engineers. ISBN 978-0-7844-1032-5. Frémy, Dominique (1989). Quid de la tour Eiffel. R. Laffont. ISBN 978-2-221-06488-7. The Engineer: The Paris Exhibition. XLVII. London: Office for Advertisements and Publication. 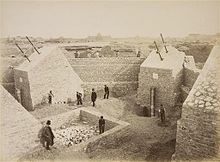 3 May 1889. Harriss, Joseph (1975). The Eiffel Tower: Symbol of an Age. London: Paul Elek. ISBN 0236400363. Harvie, David I. (2006). Eiffel: The Genius Who Reinvented Himself. Stroud, Gloucestershire: Sutton. ISBN 0-7509-3309-7. Jonnes, Jill (2009). Eiffel's Tower: The Thrilling Story Behind Paris's Beloved Monument …. Penguin. ISBN 978-1-101-05251-8. Loyrette, Henri (1985). Eiffel, un Ingenieur et Son Oeuvre. Rizzoli. ISBN 978-0-8478-0631-7. Musée d'Orsay (1989). 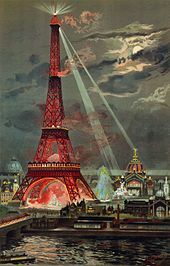 1889: la Tour Eiffel et l'Exposition Universelle. Editions de la Réunion des Musées Nationaux, Ministère de la Culture, de la Communication, des Grands Travaux et du Bicentenaire. ISBN 978-2-7118-2244-7. Vogel, Robert M. (1961). 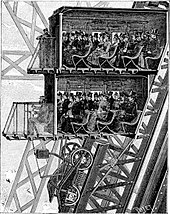 "Elevator Systems of the Eiffel Tower, 1889". United States National Museum Bulletin. Washington, D.C.: Smithsonian Institution. 228: 20–21. Watson, William (1892). Paris Universal Exposition: Civil Engineering, Public Works, and Architecture. Washington, D.C.: Government Publishing Office.